For much of the viewing area, this has been the 14th consecutive day of below normal temperatures. It looks like rain on radar, but it is virga or precipitation that is drying up before it hits the ground. What this virga is doing is "seeding" the clouds to moisten them so the next wave of precip will make it to the ground. That will be tomorrow morning. Note the blurry, lumpy mid clouds with the virga in the early afternoon. Now notice how the cloud texture has changed & the clouds have lowered. This shows how the virga has moistened up the troposphere. Showers will increase Friday morning to pretty steady light rain. 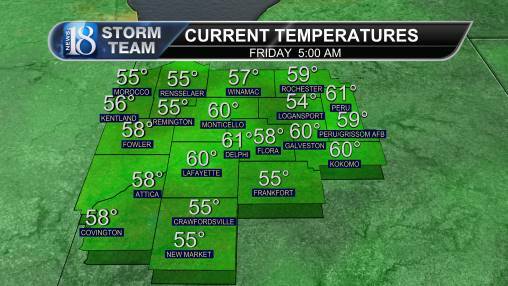 Highs will run 45 south to 51 far north & 48 in Greater Lafayette. Friday-Saturday morning total rainfall of 0.05" in the far northwest to 0.35" in the far south & near 0.18" around Greater Lafayette seems reasonable. It will be rather breezy at times with east-northeast to northeast winds at 11-22 mph. Meanwhile, a big coastal storm or Nor'Easter will hammer the Gulf Coast & Northeast with heavy rainfall, high tides, wind & even interior heavy snowfall in New England. Here, with less wind & mostly cloudy skies Saturday, isolated showers are possible, followed by rainfall overspreading the area via Alberta Clipper Sunday afternoon. With gusty southwest winds becoming northwest Sunday, highs will run 50-55. Rainfall totals Sunday-Monday morning should run 0.15-0.35". 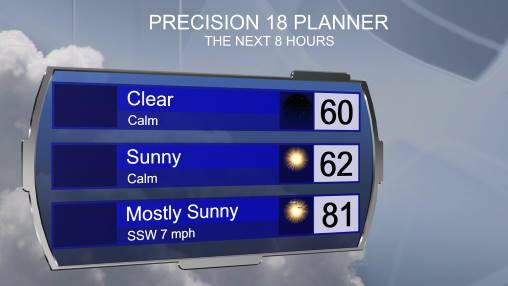 After clouds & a couple isolated showers with the troughiness Monday, Tuesday looks great with sunshine, not a lot of wind & highs 58-63. With gusty south to southwest winds & increasing clouds, highs on Halloween will reach 63-67. The 60s warmth should continue right into the evening as a band of rainfall & even a couple of embedded rumbles of thunder/flashes of lightning approach. The potential of getting wet for Trick-or-Treating still looks to increase as the evening wears on with 20% of rainfall at 6 p.m. to 30% by 7 p.m., then it skyrockets to 60% 8-9 p.m. This could still change. The rainfall may speed up or slow down, but this is the best estimate right now. The earlier you go treat-or-tricking, the better. Rainfall Wednesday night to Thursday morning of 0.50-1" is possible with isolated +1" amounts as we transition to wetter November regime. It looks active, rather stormy, windy & mild in the early half of November. In fact, the GFS model has the lowest temperature now-November 15 in Lafayette at 33. NAO will go to its most positive level in early November since early October. This signals warmth. Note how it suddenly went negative & we suddenly went into this colder pattern. The MJO, which has been in Phase 2, a cold phase, looks to go into Phase 7, 8 then 1, which are all warmer phases this time of year, on average. This signals our big warm-up in November. After mid-November note how we are projected to stay in Phase 2, 3, 4, then 5, which are all cold phases of the MJO. This signals much colder weather ahead. Note how we go to a Phase 6 around Thanksgiving, signaling that warm up that may occur for a bit at the end of November (before turning sharply colder with time in December). What are MJO Phases? They all have varying effects on our weather at various times of year. One phase in one part of the year will give you a different response in another part of the year. The MJO is just another piece of puzzle that works with a lot of other factors to help build a forecast. Multiple storm systems will lead to above normal rainfall & potential of severe in a couple of instances. Much colder weather will rush in after mid November. Minor snowfall could even occur. There are signs of a stratospheric warming episode in the Arctic, which signals that a dislodging of cold, cold air could occur in the eastern U.S. after November 15.